If you’ve never attended a GSO performance, or even the symphony at all, we want you to feel as prepared and welcome at our concerts as our longtime patrons. We’ve compiled first timers’ most frequently asked questions into this handy, all-inclusive guide that takes the guesswork out of the orchestral experience for everyone. Is your question not addressed in this list? We’re here to help. Let us know. What exactly is a symphony orchestra? What instruments are involved? WHERE THEY SIT: In a semicircle directly in front of the conductor; they comprise more than half the orchestra. WHERE THEY SIT: A few rows back from the conductor in the center of the orchestra. WHERE THEY SIT: Since they’re the loudest, you’ll see them positioned at the back of the orchestra. Some works use lots of different percussion; others may have a single musician playing the kettledrums, or no percussion at all. WHERE THEY SIT: Also found at the back of the orchestra near the brass section. Why does the oboe start the warm-up? No! But if you’d like to study up beforehand, we publish our concert program notes before each Masterworks and Chamber Orchestra concert here. They are also printed in our programs supplied to concertgoers if you’re seated in time to read through them before we dim the lights. 1. Arts Writer Paul Hyde of The Greenville News conducts free Pre-Concert Talks one hour prior to our Masterworks Series concerts in the backstage rehearsal room of the Peace Center Concert Hall. To locate the backstage rehearsal room, simply ask an usher upon entrance to the Concert Hall lobby. 2. Maestro Edvard Tchivzhel joins members of the Guild of the Greenville Symphony the Friday before each Masterworks concert in a private home for a Concert Preview of that weekend’s performance. You can learn more about becoming a member of The Guild here. Both the Concert Hall and Gunter Theatre are located at the Peace Center in downtown Greenville at 300 South Main St., on the corner of South Main and Broad Streets across from The Greenville News. There are more than 6,500 off-street parking spaces located throughout downtown offering convenient parking within walking distance to The Peace Center. 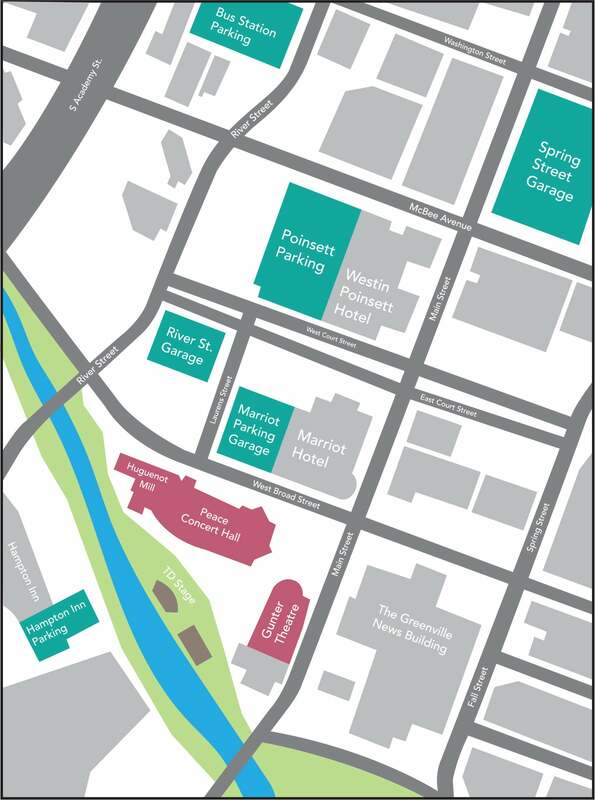 Here is a list of city-owned garages and lots in downtown Greenville, and here is a map of the Peace Center’s nearby garages. What time should I arrive at the concert hall? Plan to arrive no later than 30 minutes before the start of the concert to allow ample time to visit concessions, the restrooms and locate your seat in the hall. Don’t forget to factor parking and travel-related variables into your departure time! Ample ushers can be found throughout the lobby and are located at all concert hall entrances. They can help guide you to the right entrance and directly to your seat. Though refreshment cannot be enjoyed inside the concert hall, a selection of non-alcoholic beverages, as well as beer and wine is available for purchase in the lobby. Additionally, the dramatic Genevieve’s Theatre Lounge overlooking the TD Stage features small plates and a full bar and is open on some Saturday Masterworks Series performances; check availability here. Masterworks, Chamber Orchestra, and Holiday at Peace concerts are usually around two hours including an intermission. Spotlight Series concerts are approximately one hour without intermission. Intermission for our Masterworks and Chamber Orchestra Series, as well as our Holiday at Peace performances are twenty minutes long. Although you won’t see many people in jeans, dress however you are comfortable! There is no dress code for GSO concerts. Typically, concert attire ranges from business casual to more formal business attire — dress up or dress down; it’s totally up to you! We welcome children ages 5+ at our concerts. Tickets are required for children, regardless of age. Learn more about our Sunday Funday program, which provides families with complimentary tickets for the kids to our Sunday matinee Masterworks Series concerts. Additionally GSO performs free Lollipops & Once Upon an Orchestra concerts in the community for children of all ages. Learn more about other opportunities GSO offers children here. What if I need to cough during the concert? It’s always a good idea to bring cough drops or lozenges with you whenever attending a live performance. If you don’t have lozenges with you and if possible, try to cough at the end of a movement. What if I arrive late to the concert hall? Concert hall ushers are instructed to seat latecomers at the end of a movement, and will indicate when you may enter the hall to take your seat. Applause at GSO performances is meant both as a greeting and to show appreciation for the artists. Just before the concert begins, and after all the musicians are seated, the concertmaster takes the stage. Traditionally, patrons applaud at this time to greet the concertmaster, and then again a few moments later to greet the conductor and soloists. Many musical works have multiple movements or sections. A short pause often follows each movement, and it is customary to refrain from applauding during these pauses. However, after the final movement of a work, applaud to your heart’s content! If in doubt, applaud with everyone else. Are cameras and other recording devices allowed? Cameras, audio recorders and video recorders are NOT permitted at concerts, as they may interfere with the musicians’ performance. Also please turn off or silence all cell phones, pagers, watch alarms, and other electronic devices before entering the hall.